The new Angel 21 bus next to the iconic Angel of the North - which is 20 this year. To help cope with increased demand on the popular Angel 21 service, which will feature ‘Angel 20’ badges to celebrate the momentous milestone, the award-winning bus operator has purchased larger double-deck buses to service the route, accommodating 16 extra passengers per hour - including four more accessible lower-deck seats. 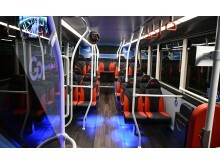 For comfort and convenience, the buses now offer upper-deck tables featuring casino and board game designs, larger LED next-stop announcement displays, USB connections and free Wifi– additions made by Go North East following customer feedback. And, contactless payments can be taken on board the brightly-coloured vehicles, which are easily identifiable thanks to their iconic Angel of the North emblazoned livery. Following an investment of over £10million in new vehicles and upgrades in 2017, the significant cash injection has put 19 brand new vehicles on the road, featuring the latest, most environmentally-friendly Euro 6 stop/start engines. Fitted with a third-generation micro-hybrid system, they also save 21% fuel and carbon dioxide. 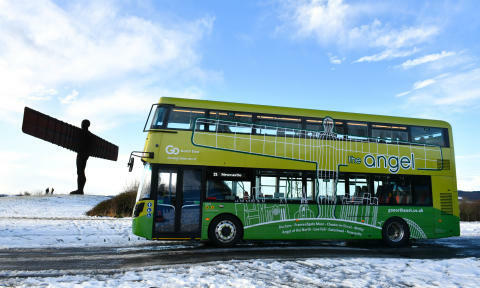 In an effort to ensure the millions of passengers using Go North East services each year continually benefit from an undisrupted, high-quality service, the investment includes a further two dedicated spare double-deck buses built to the same specification as the new Angel vehicles. With no timetable changes, Angel customers can jump aboard the new buses every seven to eight minutes between Newcastle and Chester-le-Street, with services continuing to Durham every 15 minutes.